I created this quickly for the Daily Create at DS106 the other day. The assignment was to make a stopmotion video of something in the kitchen. I am lucky. Every now and then, I get a box of graphic novels delivered as part of my work with The Graphic Classroom website (which may or may not still be around. I still get the books, though, and review them here.) I had to snap a Vine of the box, just minutes before my youngest son dove in (he gets first look, of course). I want to thank everyone who gave my video game a try the other day. 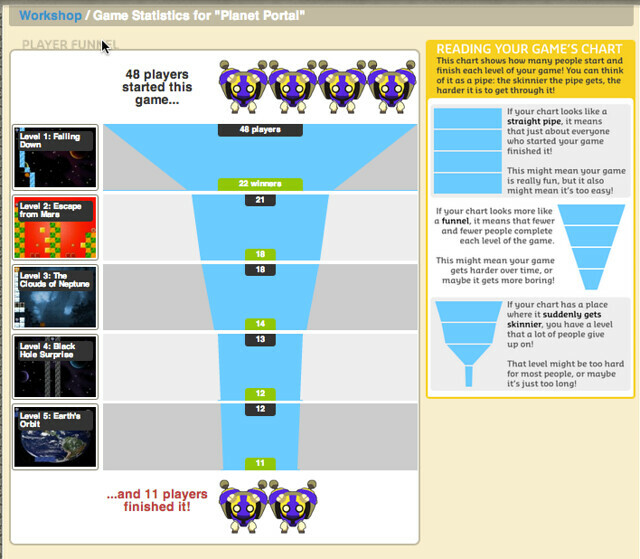 I had asked friends to play my game, Planet Portal, so that I could share with my high school students some of the useful data stats generated by Gamestar Mechanic as part of a lesson around game design. The image above is what got generated by the play of my game, level by level. You can see how many people started the game and how many ended, and where they abandoned the game along the way. This is a critical piece of information around design because it helps the designer find a balance between easy and difficult. And here are the level maps from my game, in case you are interested. Plus, if you want to try Planet Portal, you can do that, too. My band, Duke Rushmore, played at a pig roast over the weekend. It was a blast, and our lead singer brought along some Elvis sunglasses with him. We all decided to try them on (who can resist Elvis glasses?). Here is the collage I made of the band. (Our only regret is that we didn’t put the glasses on the pig.) 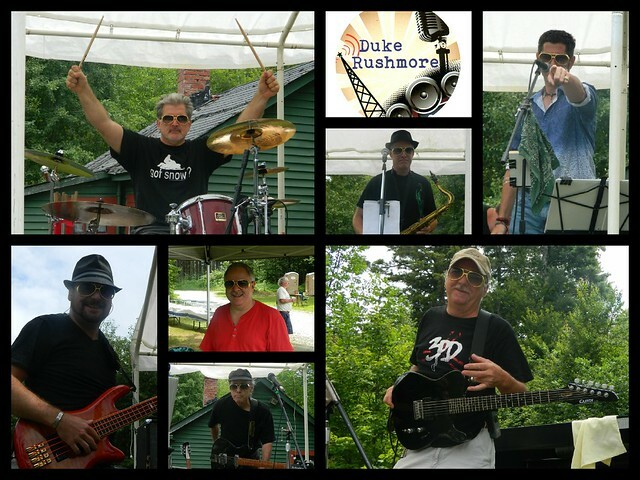 You can always check out our Duke Rushmore home on the web, and if you live in Western Massachusetts, come out and see us play. You’ll have a great time, dancing the night away. If you have not had the opportunity to read Gene Leun Yang’s graphic novels, you really should. His eye for detail and for bringing the mystical into a story is interesting to experience. 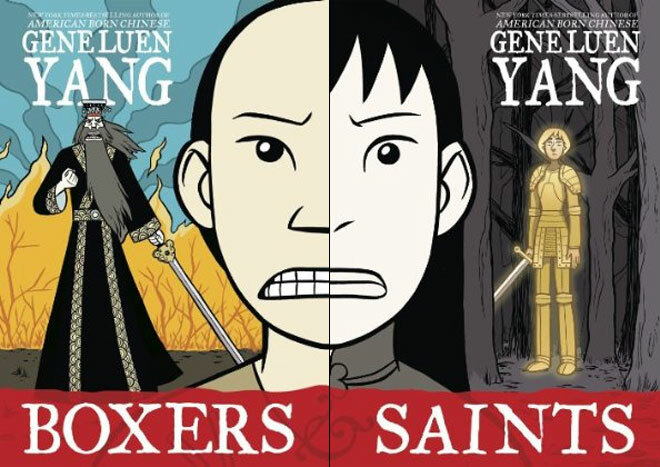 American Born Chinese is becoming a fixture in many classroom, and it should be. That graphic novel is storytelling at its best. His latest books are two stories of China that are really one story, told from two perspectives, in two different graphic novels. Boxers focuses in on the Chinese resistance to Christian missionaries and Europeans who came to “tame” China (and reap its wealth, too, of course) in the late 1800s. The graphic story centers on Little Bao, who emerges as a leader of the resistance forces who seek to throw the white invaders out of China and retain their Chinese cultural identity. Saints is the companion book, viewing the same events through the eyes of a young girl who sees the Christian faith as the true path forward, seeing progress in the new religious views and savagery in those who remain fixed in the past. I wish Saints were as powerful as Boxers, but I fear not. Yang seems to have focused much more of his creative energy on the story of resistance, and the story is wonderfully told, with deep characters, motivations and illuminating artwork that brings the reader not only into the mind of Little Bao but also into the heart of China, with all of its deep history and cultural pride. Be warned: there are gruesome battles in these books, and are not for the feint of heart. The violence is part of the setting, however, and Yang is not one to toss blood and gore into a story just for the heck of it. Saints is the weaker of the two books, thinner in both size and in story. A young girl, an outcast in many ways in her own family and village, finds faith in the Christian missionaries, and finds companionship in the spectral image of Joan of Arc, who visits the girl (Vibiana, her name after her conversion) regularly to inspire her faith and her heart. While Vibiana is a character to care for (there are funny, telling scenes at the start of the story that provide a rich insight into who she is), the story of her growth and her role in the stamping out of the resistance movement lacked the development of Boxers, in my mind. But Yang’s move to wrap these two stories around each other was intriguing. We catch glimpses of both characters in the other story from time to time. I read Saints first, and had that in my mind as I read Boxers. But I wonder if my experience would have been different if I had read them the other way around? Yesterday’s Daily Create at DS106 suggested we take a panoramic photograph of a room in our house. I am no photographer, so this use of imagery is very different for me. But I was game and I figured, there has to be an app for that, right? Of course there was. I first tried a free app for panoramic image but it was difficult to use, and I got frustrated with it. So, I pumped out 99 cents for an app called Panorama 360 Camera. It’s great, and includes an automatic helper for taking your photos. The app stitches them together for you into a 360 degree view. I took the iPad and app outside and captured my backyard with it (I wanted to get my dog in every image but he would not work with me! 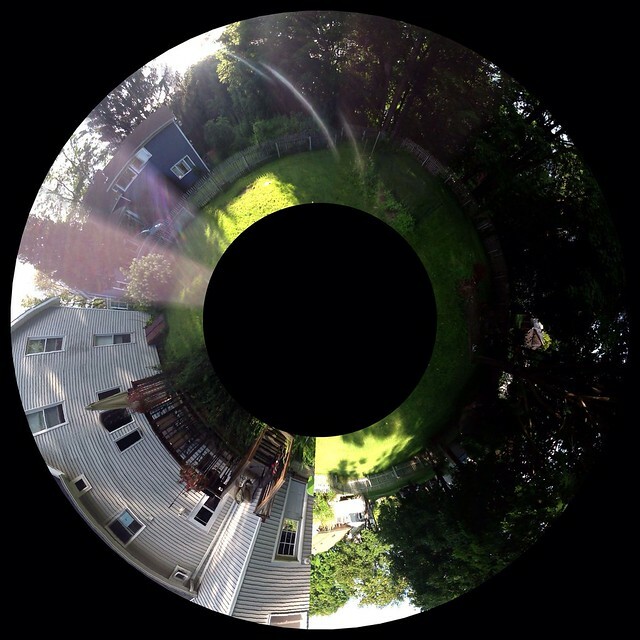 ), but used one of the app’s filters to create this different kind of 360 experience. It transforms my yard into a world, doesn’t it? As I noted the other day, I am a little mixed on badges, so I am exploring their use and creation where I can. Paul Oh has used the badge tool at P2PU to create a badge for Making Learning Connected MOOC. He and Sherri Edwards even posted a Google Hangout about how it works. I went through the process and added a mapping project to earn my badge. While the badge is at P2PU (an open source learning space, which ties in nicely to the MOOC), I found I could also put the badge there into my Mozilla Badge Backpack, which is another place I need to fool around with a bit more. What I like, and what Paul articulated somewhere, is that the CLMOOC Badge is more than just a stamp of experience; It represents yet another space where people are sharing out and reflecting on some project that exemplifies their exploration in the CLMOOC summer. It’s a way for us to honor what we did and celebrate our own efforts. Did you make something this summer? Come get your CLMOOC badge. As much as I can, I am trying out the Daily Creates at the DS106 site. Each day, someone posts an interesting hack/remix/create idea and you do it if you can. No pressure. Yesterday, the Daily Create asked for folks to recreate a Tabloid newspaper with news about DS106. 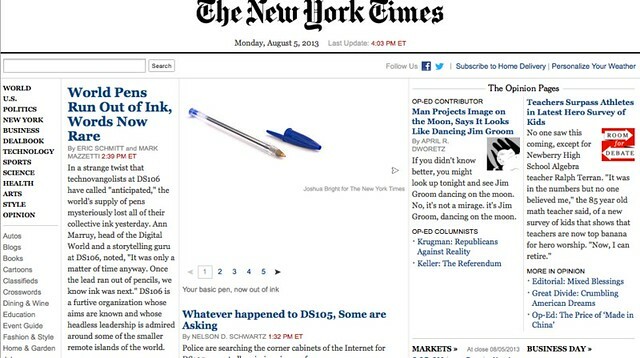 I used Mozilla’s XRay Goggles and hacked at the New York Times. I’m sure they don’t mind (ha). I decided to tweak the idea of how we write with my main article. 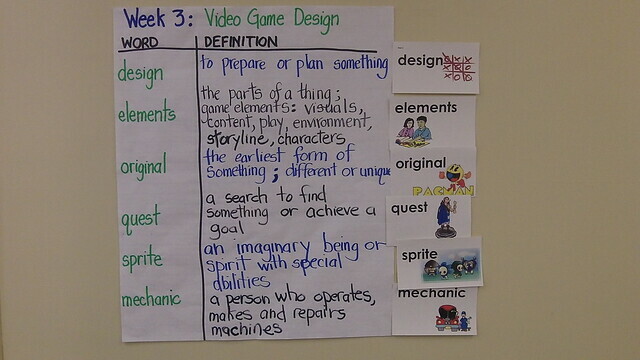 I’ve mentioned before how we are pulling direct instruction around vocabulary into our Digital Literacies/Game Design Workshop for ELL high school students this summer, weaving in learning with play. 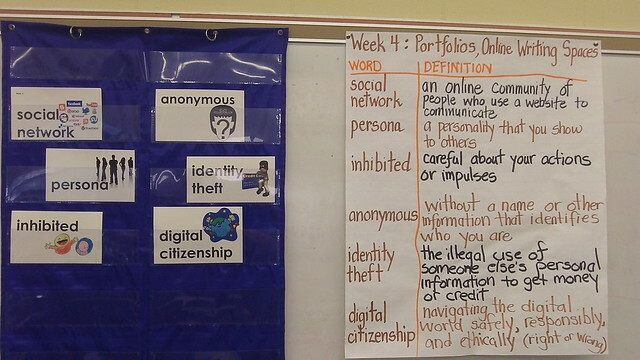 Along with a weekly word list and word wall that connects to what are discussing, we have been designing activities to get our students to use the words. 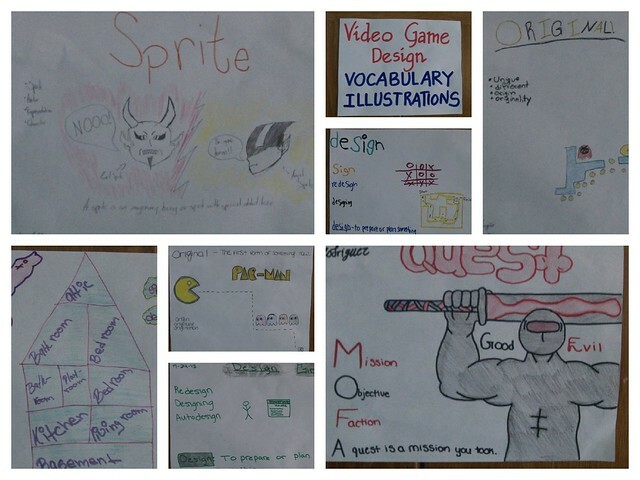 The above image showcases one activity, where students explored a word through art and synonyms and definitions. Below are two more weeks of Word Walls.